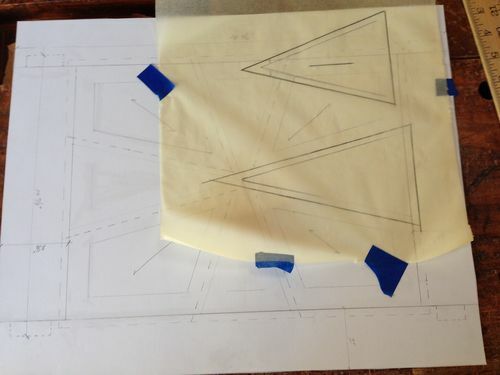 … and positioned it inside the opening to double check the proportions. All is well. Now I just have to duplicate the drawing using eight little pieces of wood. Tools don’t fail me now! By making this panel first, I can take up any slack within the stiles and rails. By design the stiles and top rail are 2” wide and the bottom rail is 2-1/2” wide. I have also planned for a 1/8” gap all around the door. If the eight piece panel doesn’t come out quite as planned, I can alter the stiles and rails slightly without altering the overall look. Besides, what’s a sixteenth or so amongst friends. 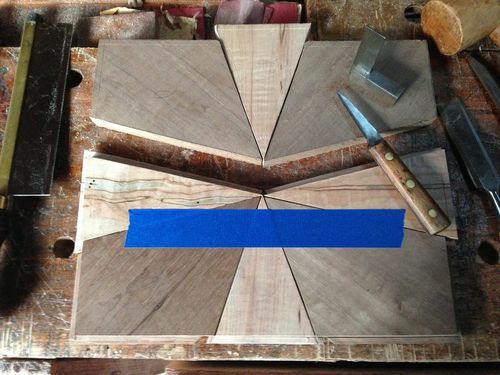 … and transferred the individual parts to pieces of walnut and Ambrosia maple. … I had all eight parts. The maple has a nice curl that should really pop once boiled linseed oil is applied. 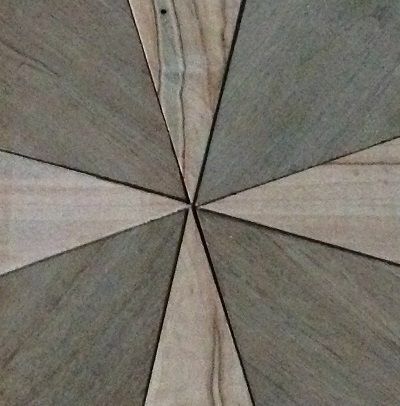 ... and tongues and grooves on the walnut parts. Each part was fitted to the rest and trimmed where needed. 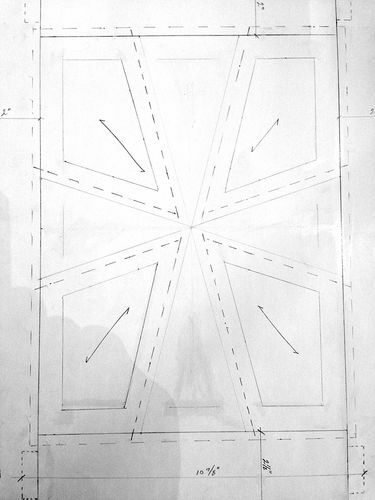 And there you have it … an eight piece door panel. 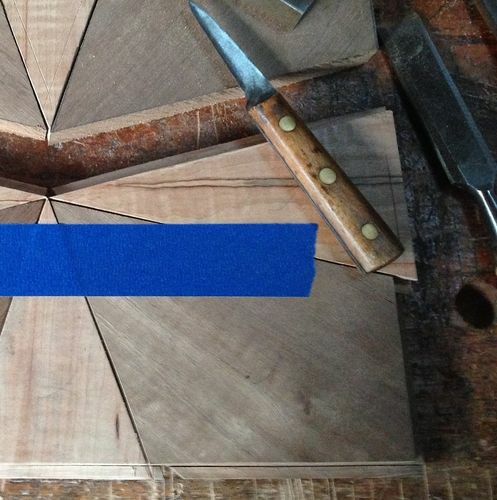 Before enclosing the panel with stiles and rails … all twenty-eight edges will be chamfered to add depth, and of course the walnut dyed. 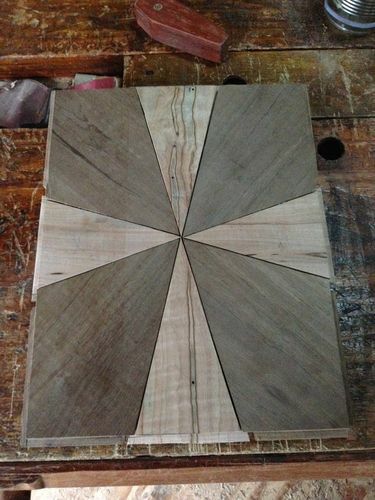 Gosh, that’s going to be a pretty door. How did you decide the ratio in the pieces? They don’t quite look like even thirds, maybe 3/8, 2/8, 3/8? Pleasing to the eye, whatever it ended up being. This is very nice!! When I have a large project going, I try to commit to a minimum of 2 hours per day work on it. Often times I do more but I try to commit to 2 hours. What is your strategy? Wow, Ron! That door is fantastic! Did you have to do much fiddling to get the eight pieces to fit together well? 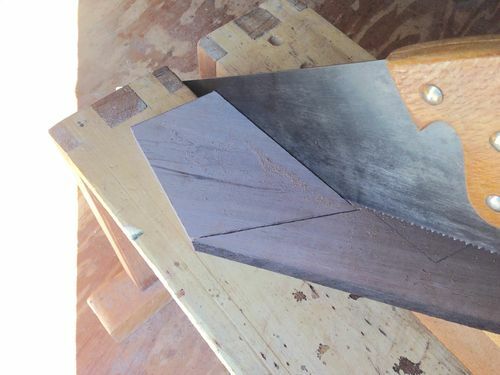 Or, does it not need to be perfect because the chamfered edge will hide some minor misalignments? This door is the heart and soul of woodworking, offering new challenges and opportunities to incorporate into your work your craftsmanship and sharpen your skills. The result – a great deal of satisfaction. Great work, I’m sure you enjoyed every minute of the process. Onwards and upwards! Great progress. I’m sure you will finish it by Easter. This is truly fine and beautiful, and the amazing thing: You have appeared in one of the pictures! Gosh, that s going to be a pretty door. How did you decide the ratio in the pieces? They don t quite look like even thirds, maybe 3/8, 2/8, 3/8? Pleasing to the eye, whatever it ended up being. Thanks, Dave. 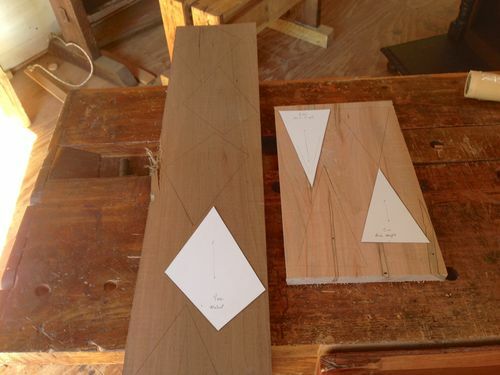 Actually, I started out with true thirds across the horizontal, and used that same measurement for the maple piece along the vertical. 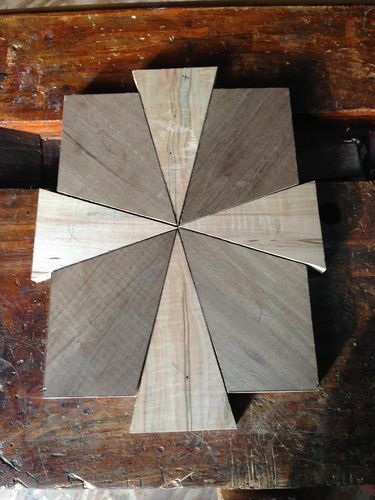 I was only after fitting the center that I had to shave a bit off of the maple pieces. Thanks, Kelly. What is my strategy? Well, a lot depends on the weather. Overcast days are not friend … too dark to see. If the weather is nice, I’m in the shop. Being retired affords me lots of time to be in there … after vacuuming, sweeping the stairs, and cleaning up the bathrooms and kitchen … as my bride still has a nine to five … LOL! Thanks, Dan. Yes, a great deal of fiddling took place! 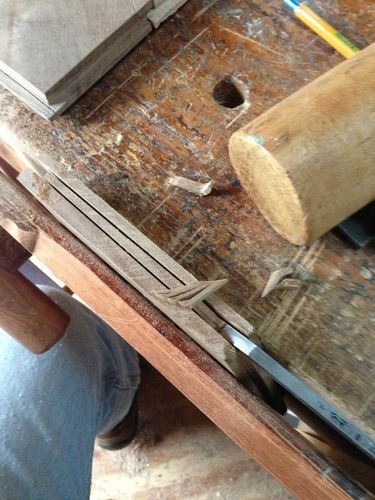 I tried to follow the lines as best I could with that 7 ppi rip saw but … well … a sharp line on paper and a monster saw kerf are two different things! But yes, I hope the chamfered edges will hide the misalignments. 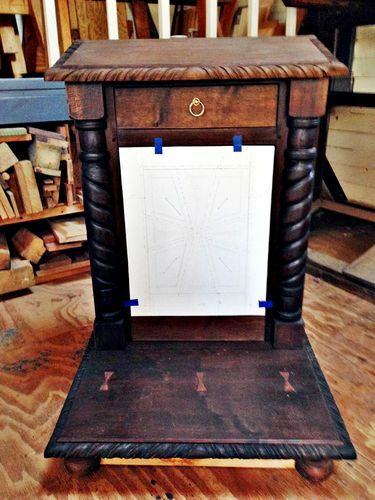 This door is the heart and soul of woodworking, offering new challenges and opportunities to incorporate into your work your craftsmanship and sharpen your skills. The result – a great deal of satisfaction. Great work, I m sure you enjoyed every minute of the process. Thanks, Tom. Considering the tools used, I am very satisfied with the end result. I envisioned this panel from day one and have fretted over it since. I think now I’ll just smile and move on to the next task! Onwards and upwards! Great progress. I m sure you will finish it by Easter. Thanks, Jim. Yes, now that the hard part is behind me, completion is just around the corner! Thanks, Daniel. 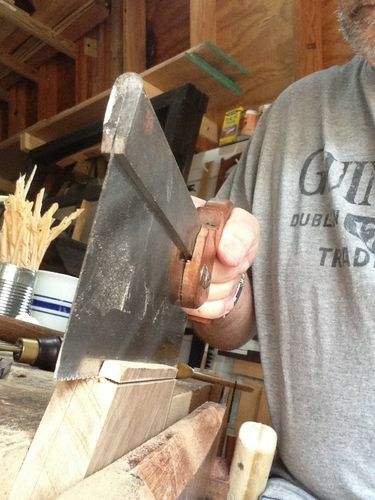 My appearance has to be credited to the Pop-Socket on my phone and the fact that a tenon saw takes but one hand to operate … LOL! Looking back at some of the blogs I see you are making nice progress. It’s going to be one heck of a piece when finished. Looking back at some of the blogs I see you are making nice progress. It s going to be one heck of a piece when finished. Thanks, Dave. Yes, this one will be hard to give away! Ahh. “Thirds with a fudge-factor.” Makes sense, and as I said, it looks good to my eye, so there it is. I’m a little jealous of the shop time you get, being retired. I had to hurry to wrap things up yesterday because we had dinner plans, and had to run to Rockler for red TransTint today and I probably won’t get any more significant progress until next weekend. But with a Valentine’s Day present in the works, I had to get the dye for the first bit of pore-filling. I m a little jealous of the shop time you get, being retired. I had to hurry to wrap things up yesterday because we had dinner plans, and had to run to Rockler for red TransTint today and I probably won t get any more significant progress until next weekend. But with a Valentine s Day present in the works, I had to get the dye for the first bit of pore-filling. Depending on the weather I can get upwards of eight hours a day in the shop. I had none today due to the rain. It was just too dark. I needed to finish Dan Brown’s new book Origin, anyway! Valentine’s Day present in the works, huh? I guess that explains the red TransTint. LOL! You should give the red wine trick a go one day. Thanks again, Dave. I thought about the red wine trick, but until last July, you couldn’t buy wine on a Sunday here in MN, so I didn’t even think of trying to get some this morning. Plus I think the TransTint will work better mixed with the white pore-filler. 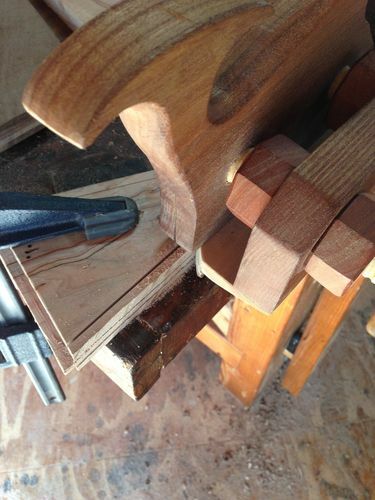 For the inside of the curves in red oak, I figured that was a quicker solution to filling the pores. I’ll definitely be posting the project when it’s done, but it might be right down to the wire. Sounds like a good day for you, even without shop time. I thought about the red wine trick, but until last July, you couldn t buy wine on a Sunday here in MN, so I didn t even think of trying to get some this morning. Plus I think the TransTint will work better mixed with the white pore-filler. For the inside of the curves in red oak, I figured that was a quicker solution to filling the pores. I ll definitely be posting the project when it s done, but it might be right down to the wire. Sounds intriguing … can’t wait! Funny thing about laying on the couch to read, though … every time I do I fall asleep … I’ll never finish this book!